A Sphinx is a mythological creature with the body of a lion and the head of a person. In Ancient Egypt a lot of times the head was that of a Pharaoh or a god. The Egyptians built sphinx statues to guard important areas such as tombs and temples. The most famous Sphinx is the Great Sphinx of Giza. It is one of the largest and oldest statues in the world. Archeologists believe that it was carved around 2500 BC and that the head is meant to be the likeness of the Pharaoh Khafra. The Great Sphinx faces the sunrise and guards the pyramid tombs of Giza. The Great Sphinx is huge! It is 241 feet long, 20 feet wide, and 66 feet high. The eyes on the face are 6 feet tall, the ears over three feet tall, and the nose would have been nearly 5 feet long before it was knocked off. It is carved out of the bedrock in a trench at the Giza site. How did it originally look? Over the past 4500 years weather and erosion have taken their toll on the Great Sphinx. It is really amazing that so much of it is left for us to see. The original Sphinx would have looked a lot different. It had a long braided beard and a nose. It also was painted in bright colors. Archeologists think that the face and body were painted red, the beard was blue, and much of the headdress was yellow. That would have been an amazing site! No one is entirely sure exactly how the nose got knocked off. There are stories that Napoleon's men accidentally knocked off the nose, but that theory has proven untrue as pictures have been found without the nose prior to Napoleon's arrival. Other stories have the nose getting shot off in target practice by Turkish soldiers. 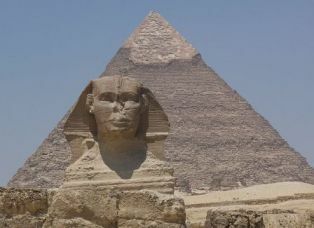 Many people now believe that the nose was chiseled off by someone who considered the Sphinx evil. After the Sphinx was built, over the course of the next 1000 years it fell into disrepair. The entire body was covered in sand and only the head could be seen. Legend has it that a young prince named Thutmose fell asleep near the head of the Sphinx. He had a dream where he was told that if he restored the Sphinx he would become Pharaoh of Egypt. Thutmose restored the Sphinx and later became Pharaoh of Egypt. There was also a famous Sphinx in Greek Mythology. It was a monster that terrorized Thebes, killing all those who could not solve its riddle. It was the Greeks who gave the name "sphinx" to the creature. The beard was likely added to the Sphinx during the period of the New Kingdom. A portion of the beard can be seen in the British Museum in London. 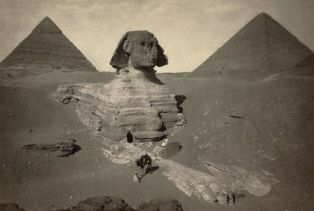 Efforts are being made to preserve the Sphinx, but it continues to erode.